What happens if it rains on the interactive cruise? We sail rain or shine. Please plan to dress according to the weather, including bringing rain jackets, ponchos, and umbrellas. If we have to cancel due to weather this is usually done at the dock. Most of the afternoon storms that we get are over in 15 to 20 minutes. We have a waiting area under cover so sometimes the trip will get delayed. No, strollers are not allowed on board. Sorry for any inconvenience. Can we buy tickets the day of the trip? We recommend buying tickets in advance as most cruises sell out. We cannot sell more than 39 tickets for any cruise, so buy your tickets early to not miss out on the fun. Everyone on board needs to purchase a ticket. Check availability online. No, there are life jackets for every passenger aboard the pirate ship, but the Coast Guard has deemed it safe to not wear life jackets during our cruises. Prior to departure we will teach you how to properly put on a life jacket. If there is an emergency, our highly trained staff will instruct passengers to wear life jackets to ensure their safety. Are the waters rough? Will I get sea sick? It is unlikely, as we sail in the calm protected waters of the Lewes/Rehoboth Canal. It’s a smooth sail unless we hit a wake from another boat. How many people do we need for the cruise to go out? We need a minimum of 15 people in order for us to sail. We reserve the right to reschedule / refund your cruise if under 15 tickets are sold. The pirate ship will depart promptly at the time posted on your reservation. Please arrive 30 minute prior to departure. No refunds or rescheduling will be issued for passengers who miss departure. No, the pirate ship does not allow smoking on board the ship or on the dock. Can we rent the boat for a private party/event? 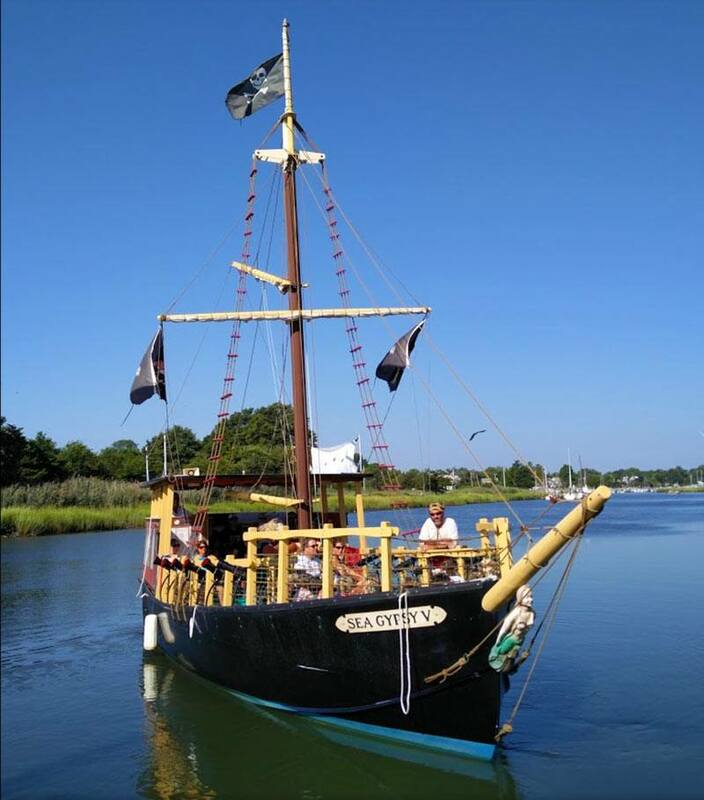 Yes, the pirate ship can be chartered privately for the children’s cruise or private party/sunset cruise. Please call our office at (302)249-3338 to schedule your charter. No, but there is a clean porta-potty next to Anglers Marina. Please use the land-based bathrooms before you board! The pirate adventure cruise during the day is approx 70 mins. Our evening cruise last for 2 hours. Children are required to wear something close toed (Shoes), absolutely no sandals/flip flops are permitted. Is there any food or drinks on the boat? No, we do not sell any food or beverages on board, but feel free to bring your own snack or drink, within reason. Please pack in, pack out. Water may be purchased at the dock. Check in at the Pirate Shack located at the end of the Lewes Docks, right next to Irish Eyes restaurant. You will be escorted from the dress up area to the boat by the crew. Please drive past Irish Eyes restaurant and the Anglers Marina. There is parking located to the right of our pirate shack. Is this scary for the kids? Is this fun for girls too? Absolutely! Our young lass often outnumber the boys! It’s truly a fun experience for all on board. When our water cannons go off, you may get misted during battle. Especially if the scallywag we are chasing fires back! However, there are areas of the boat where you can go if you’d like to stay dry, but no guarantees-we are a vessel at sea! Do you sell pirate goodies? We have many wares in our Pirate Shack you just have to ask! Stuffed Parrots, Swords, Hats, T-Shirts, there’s plenty of loot to be had! What happens if theres severe weather forecast for my cruise? If severe weather is in the forecast for Lewes, our captain might have to cancel a cruise. If this is the case, we would notify ticket holders via email as soon as that decision was made. At that point, we will give you a gift card for a future booking or a full refund. Gratuity is not included however it is very much appreciated. Our staff works very hard all summer to make this the best experience for you possible!